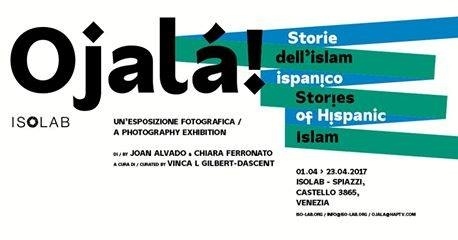 The 7th of April I will be in Venice to hold the presentation of "Ojalá, Stories of Hispanic Islam". Ojalá is the photographic installation resulting from combining "Cuban Muslims-Tropical Faith" with the project "Daughters of Al-Andalus" by the great Italian photographer Chiara Ferronato. All geniunely curated by Vinca L. Gilbert-Dascent, and in ISOLAB, one the nicest spaces I have seen in a long time. 7th of April at 18:00h there will be a talk in ISOLAB to present the Installation, where Chiara and I will be joined by Enrico Stefanelli from Fotolux Festival. Very grateful to Vinca, Chiara and ISOLAB for their work and help to generate all of this.